Distributor: R1 DVD from ADV Films out of print. Notes: This is a spinoff of the ever-expanding Leiji Matsumoto universe of Captain Harlock and Galaxy Express 999. The original review is by Christi, with an addendum by Carlos Ross. The comrade-in-arms of Captain Harlock, Emeraldas, finally gets her own OAV series. Traveling the Sea of Stars with her ship, the Queen Emeraldas, she crusades for freedom against a tyrannical universal government. During these travels, she comes upon a kindred spirit, the young Umino Hiroshi, upon whom she bestows the mantle of Tochiro, the famed engineer whom Hiroshi idolizes, and in Emeraldas's eyes, whose spirit he embodies. I must start this review by stating that I am so very glad to see the recent revival of Leiji Matsumoto's works. I grew up with the adventures of Captain Harlock, and I've always admired his art and way of storytelling. 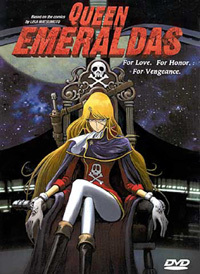 I was glad to see Emeraldas getting her own stories told, rather than being another background character to her best friend Harlock and her twin sister Maetel. But sadly, this OAV does lack in a few areas, some of which may not entirely the fault of the creators. I'll get to the short of it. What I saw was the ADV dub. And I will be the first to say right now that I am not a big fan of what ADV has done to its anime releases and the industry as a whole as of late. Sure, in the past they have tended to pick more racy fare, and they never have gone for accurate translations of the Japanese script, but have always altered it to sound more "Americanized", including adding profanity when there really was no need for it. Recently, in their quest for the almighty dollar, they have thrown out staying with the script altogether and seem to do entire dubbing sessions in one night. I am holding out now to see the sub of Queen Emeraldas, because, dear lord, the dub was the most trite, cliched thing I've seen in a looong time. And that they did this to a Matsumoto work is unforgivable. Granted, it does help to know some of the history of the characters before seeing this video. Only brief snippets are seen of Emeraldas's past, and there is no mention at all of Tochiro being her lover, which is *very* important to know as far as revelance ot the story. Otherwise, it really doesn't make sense why Emeraldas is drawn to Hiroshi. Nor does it make much sense when Emeraldas demands that the captain of the opposing army, Eldermain, remove the Jolly Roger from his ship. Yes, it means a lot to her, but just *how* much it means is totally lost on the audience if this is their first experience of the Harlock/Galaxy Express saga. It would be best to pair this video up with Arcadia of My Youth or Galaxy Express 999 for a night's viewing. The art is rather stunning and crisp, done primarily in CG as almost all new anime is these days thanks to a shortage of cels in Japan. Yet, this serves almost as much of a distraction as the stilted dialogue does. Matsumoto's style doesn't 'do' glossy very well. These are dark and dirty pirates, and they are meant to invoke a sense of deep history and a longing for a time all but forgotten, and to see his characters all sleek and shiny does give one the feeling something is out of place. It's videos like Queen Emeraldas which really make me miss the days of hand-painted cels. Computer animation hasn't come far enough yet to really give the same artistic feel a hand-drawn creation does. It comes across as artificial, like the characters are there but really aren't. The music too is pretty bland, run-of-the-mill 'operatic' themes, with a rather cheesy opening song that is almost as cliched as the rest of the OAV. These flaws are forgivable, considering the state anime is in Japan right now. They really did give it their all. Otherwise, Queen Emeraldas does have a rather engaging plotline, and well-done characterization- well, the best that could be expected with the dub script that is. They very, very badly wanted Hiroshi's personality to revolve around the phrase "I want to be strong and free!" (gack), but thankfully Hiroshi wouldn't have any of that. (Which leaves me hopeful about the sub, if such a thing exists nowadays...) The ending is climactic, and sets things up for more adventures of Emeraldas and possibly those of Hiroshi himself, as he now is in a very elite league of heroes. Queen Emeraldas is still a fairly enjoyable video, but I would recommend either hunting down the subtitled version instead of the dub. Or, better yet, petition ADV to stop mudding around with its titles in the name of trying to give fans what it wants. What we want is pure entertainment, and Queen Emeraldas tries to provide it, but is constrained from doing so, which is very sad indeed. Which leads us to the final irritation of this series: after years of dickering around, rumors are that ADV still hasn't released all of it, just the first two episodes. One of my initial worries about this review was that perhaps the low quality of the dub was detracting unduly from the actual show. So on a positive note, the voice acting on the Japanese and French tracks are superior to the badly written English dub, and lines that drone endlessly in English just seem to flow more naturally in the original audio. Ahh, better. Still, at its best, Queen Emeraldas is still just an average series that isn't quite as cool as its forebears, and while Matsumoto completists are going to dig this, the rest of us can safely give it a pass.